I've worked hard on this, but now it's finally completed. It isn't a project, but instead my first book of embroidery, and I just have to say something about it here. This is my first book, so I start at the beginning. My main theme throughout the book is that embroidery is an artform and for us, the stitches are our brush strokes. We can learn to use them, just as an artist would to achieve different effects. However, we must learn to use those brushes through practicing the stitches and seeing the possibilities each one offers us. I start with 10 basic stitches, not just how to form them, but ideas of how they can be varied and used in projects. There are suggested exercises for each one to help get you started. Then there are 7 patterns included for you to work with. 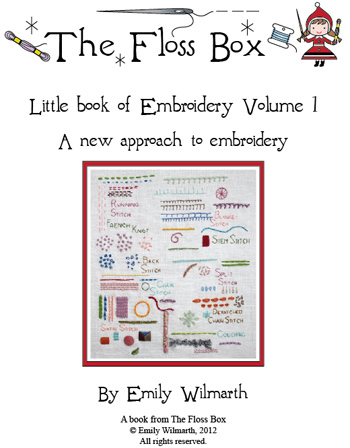 The book is 42 pages plus the patterns with many photos from my embroideries. In short, I don't just tell you how to make a bunch of stitches, but rather the goal is to show you some of the possibilities and get you thinking in a different way. It took me 8 months of on and off again work to put this together. In that time my ideas had time to grow and develop, and in some ways, this book is almost like a journal (although it isn't written like one). I've been a stitcher and an embroiderer for awhile now - I'm not a "beginner", but as I came to the conclusion of this project, I realized that I really am just a beginner, there is so much more to do and learn. Now it's time to get going and really start stitching!!! Well done - what an achievement! I just tried to buy your new book but it takes me to some strange page i have never seen before from Google!!! What is this...a google store or something....can I trust this page to buy something from it? HELP!!! Cynthia... just thought of letting you know (in case Emily is away from her pc)... I just purchased it and the google page you are referring to is just asking you to accept communication between your account and Emily's website, when you click *accept* right away signs you up and it takes you back to Emily's website and you are able to proceed with the purchase. Which you will be able to download, a few seconds to a minute after paying for it, from the *Orders* tab by clicking the *download* tab at the end of your order description/transaction. Hope it helps! Hi, thanks all for the comments. If you don't want to or have troubles logging in my site, the book is on my etsy too - Just look for the floss box there.